Congleton Cycling Campaign, UK. Voluntary Group. The Congleton Cycling Campaign is a group of volunteers who would like to see conditions improve for cycling in and around Congleton for workers, shoppers and school children. From our start-up in 1996, we have aimed to promote and encourage cycling in all its forms and to work to get the local authorities to facilitate safe cycling. We work with other cycle groups and clubs as well as the transport charity Sustrans to represent the interests of local cyclists. We are also members of the Cheshire East Cycling Campaign/Forum. To show your support, join us for only £5 per household annually, and benefit from 10% discount at the Cycle Centre in West Rd. Cycling is often quicker than using a car. Regular cyclists enjoy a fitness level equal to that of someone 10 years younger. Cycling reduces the risk of heart disease, stroke and diabetes. Cycling can reduce the levels of stress, depression and improve your self-esteem. To reduce congestion and pollution. 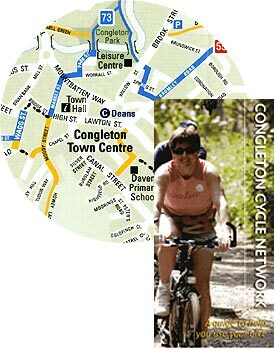 The Congleton Cycling Campaign has produced a handy cycling map (see below) to help cyclists plan trips around and through Congleton. The image on the right shows the first edition; we are now on our third edition (2011). This map shows national and local on/off road cycling routes. You can obtain this free cycling map from Congleton Library, Congleton Tourist Information Centre and some cycle shops.